Taichi Rushing and Sudden Agile Fist is an ancient shadowboxing popular in Wen county, Henan province. It features aureole all around the exerciser, so people call it supernatural shadowboxing. 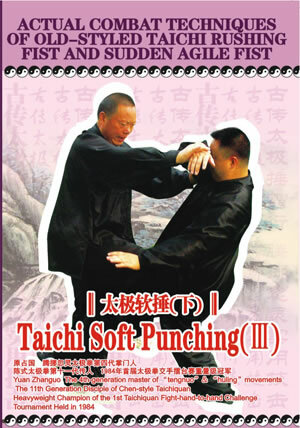 The ancients called the third routine as Taichi soft punching featuring the exercise of vital energy. The steps are like the walking of the cat, the movements like laddering. Control the breathing like the movement of the thread going through the pinhole and exert force like the puddling of iron. As a whole, it produces an impression of pliable and agile movements, smooth breathing, and integration of universe and man. It's an ideal exercise for those with relative infirm body.